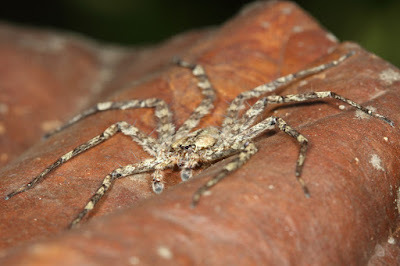 The spider in question belongs to the genus Selenops, part of a family known as the Wall Crab Spiders. Wall Crabs are remarkably flat to help them hide under stones and bark. As it happens, it also helps some of them glide through the tree tops! This gliding behaviour was discovered by Stephen Yanoviak and colleagues. They went to Panama, captured various canopy-dwelling arthropods in plastic containers and dropped them from the trees to see if they glided around marvellously or simply plummeted to the ground. Basically they went to Panama and acted like a bunch of 6-year-olds. They had far better recording equipment, though! Taking a closer look in a wind tunnel, the scientists could see how the spider uses her first two legs to steer through the air while the other six are all spread out behind her. This is the first time a spider has been seen gliding. Most spiders make use of that snazzy silk of theirs, but this one has found a whole new way of keeping her feet off the floor!